THE female suicide bomber who killed six people on a bus in southern Russia had been sent on her mission by her husband, a young guerrilla fighter who prepared her explosive belt, media reports say. The blast in the southern city of Volgograd, which also injured more than 30 people, was the deadliest attack outside the volatile North Caucasus in the past three years. The attack also raised security fears less than four months before the Winter Olympic Games arrive in the Black Sea resort city of Sochi, a prestigious event secured personally for Russia by President Vladimir Putin. Militants want to establish an Islamist state across the North Caucasus. In July, guerrilla commander Doku Umarov vowed to resume attacks against civilian targets after a brief hiatus, and to also target the February 7-23 Sochi Games. Police on Monday identified the Volgograd suicide bomber as 30-year-old Naida Asiyalova, a native of the North Caucasus region of Dagestan. The mass-circulation Komsomolskaya Pravda daily said Asiyalova was a known figure among the country's Islamist fighters. The pro-Kremlin Izvestia daily added that she had met her 22-year-old husband Dmitry Sokolov -- an ethnic Russian -- online. Komsomolskaya Pravda said Asiyalova had introduced her husband to militants, adding that he received the Islamic name Abdulzhabar but was also known under the nickname "Giraffe." Russian officials said on Tuesday they were now looking for Sokolov in Dagestan as well as Moscow. Sokolov, who went missing in July 2012, converted to Islam and is believed to have developed an interest in explosives. The newspaper said that Sokolov is believed to have made Asiyalova's suicide belt. Russian security services also suspected Sokolov of making explosives that wounded 15 people in two attacks in the Dagestani city of Makhachkala earlier this year, the newspaper said. 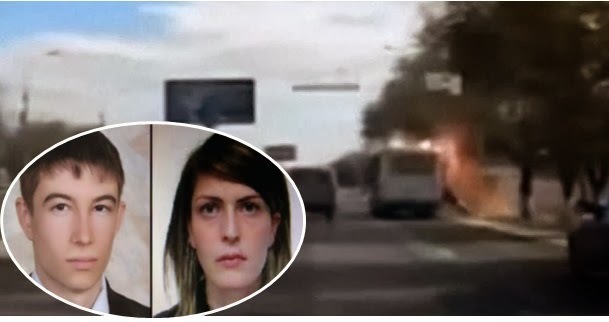 The lifenews.ru website, which relies extensively on security services sources, said both Asiyalova and Sokolov were listed on a federal wanted list at the time of the attack.